I’m on a bit of a photo wall burnout in my house right now. We have a collage wall in our living room, photos going up our stairway (well, I’ve yet to put those back up since moving our new mattress up the stairs), and I’m putting a wall of photos & art in the new home office. The thing is, I LOVE the way floor to ceiling photo walls can look. They tell a story. They show your personality by what you put up. They are unique to you. But as I began thinking about our entryway I knew that another photo wall was the last thing this house needs. Thus began my brainstorm for ways to have visual interest on a wall without the use of photos/frames/art. Here is what our entry looks like as of this morning. Excuse the poor quality pics…they’re straight off my phone. That table and mirror were both freebies from various locations. I can’t wait to change them out! This was the first area in the entire house that I decided to paint, and from the second I painted it I’ve loathed my color and sheen choice. But I have to admit, I secretly love it as well because it is the best example of how far I’ve come and how much I’ve learned about home remodeling. I love that throwback picture. That wallpaper was hands down the EASIEST in the entire house to remove (thank God!). It was very thick paper that was already loose and practically fell off once I applied the magic potion to it. So back to how the entry way is now–empty, naked, & shiny. The only thing on the walls is the sign that we had made for our wedding. Other than that there’s just the supposed to be gray, but really it’s blueish-purple SEMI-GLOSS paint. What was I thinking? Obviously I didn’t know that semi-gloss really shouldn’t go on walls. Especially walls with imperfections. The light coming in from outside bounces off the glossy wall and makes the worst reflection. So after much browsing and brainstorming I found some great options to add interest to the wall without adding a bajillion picture frames. Here are some examples of what I’m contemplating doing. 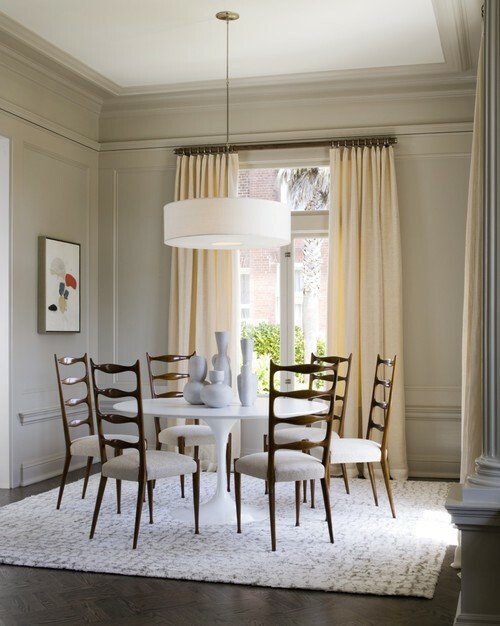 Contemporary Dining Room design by San Francisco Interior Designer Leverone Design, Inc.
Then there is the option to make a pattern on the wall to add texture. I really love the visual interest of the pictures above. It would definitely take me some trial and error to figure out how to do it, but it doesn’t look too incredibly difficult (says the girl who’s never done it). I’ll be honest with you, I’d love to put up some gorgeous wallpaper in the hall, but I just can’t bring myself to do it. I know that this house is most likely not our forever home & I can’t imagine leaving wallpaper on the walls for someone else to sweat over taking off. Or maybe it ends up being our forever home, I get sick of the wallpaper, and the I have to go through that whole annoying, labor-intensive process again. To that I say, “No thank you!”. Then there are the options that will give you the same effect as wallpaper, but that are less permanent for people like me who tend to change their minds often. I am REALLY liking the scallop stencil wall above. The last two ideas are so unique & I am thankful for creative people such as these who come up with such fun ideas! Yeah, you read it right….this was done with a Sharpie!! Mandi from VintageRevivals.com is quickly growing as a new favorite of mine. Her style is eclectic + vintage + DIY and she’s not afraid to try new things. I left the most simple for last. Although I don’t think this is what I’ll end up doing, I love the simplicity of it for how much impact it makes. And yes, I do realize that there are frames on the walls in most of the pictures above. I’m not opposed to SOME art or photos, just not an entire collage of them. Anyone else have any suggestions for me on what I could do in my entry way? I’d love a new front door (so not happening anytime soon), a vintage-y coat rack, iron banisters….I could go on and on. This project will be low $$$ and not TOO much labor. I am sure whatever you choose will look great! I just wanted to let you know I’ve selected your blog for the Liebster Award. You can get more details on my blog at http://loveofsunshine.com/blog when it posts on Friday 2/22/13. The award was passed along to me by another blogger so I hope you’ll join in the fun! That sharpie wall is cRaZy cool! Congrats on how far you have gone w/the remodel wooohooooo!